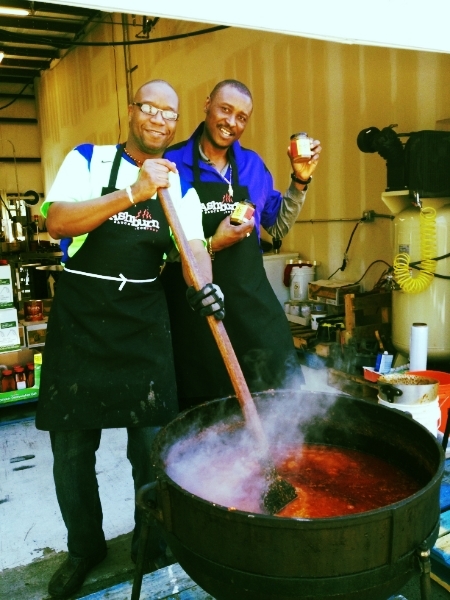 KoTo LLC was established in 2009 with a mission to introduce the world to the highest quality of hot pepper sauces and spices native to the west coast of Africa. Our recipes are authentic and have been in use for generations. We employ traditional production techniques and use the highest quality ingredients available in manufacturing our products. "The heavily spice-scented air grabs you by the throat as soon as you enter the Koto Fried Pepper Sauce warehouse on the northern edge of Fredericksburg, Va" ~ Dorothy Does"
Bickersteth formed a limited liability company with a partner –Solomon Bickersteth, a cousin, who is in charge of distribution – and found warehouse and office space only 30 minutes from home. But some time would pass before he could make that first batch of pepper sauce in his own warehouse. Acquiring equipment, and building out the kitchen, storage and office areas to comply with state and federal regulations took more time that he expected. “What I thought would take two to three months, took six months. I didn’t do much business that first year,” he remembers.